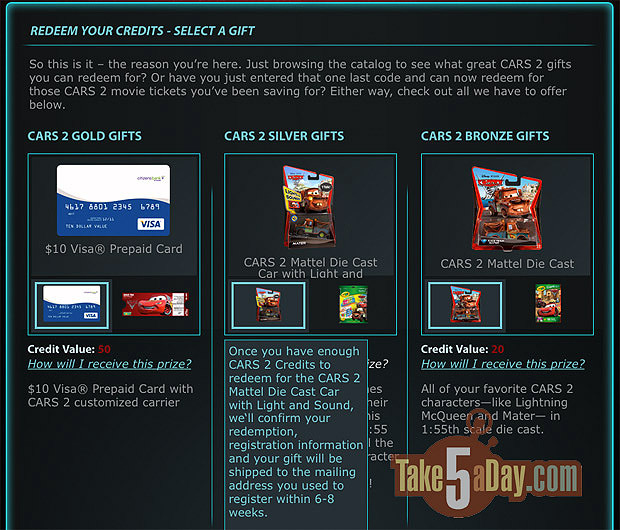 Take Five a Day » Blog Archive » Disney Pixar CARS 2: The CARS 2 Marketing Machine Starts & Get Free Stuff! 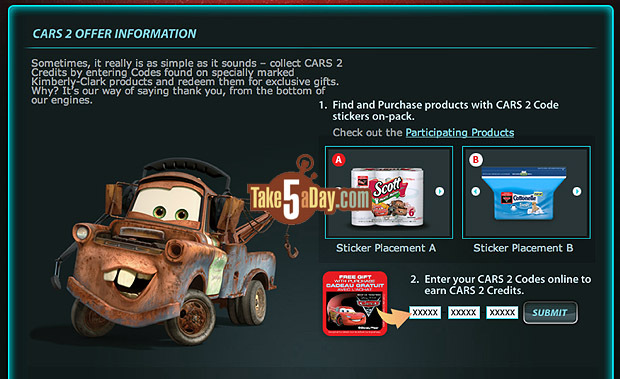 Disney Pixar CARS 2: The CARS 2 Marketing Machine Starts & Get Free Stuff! 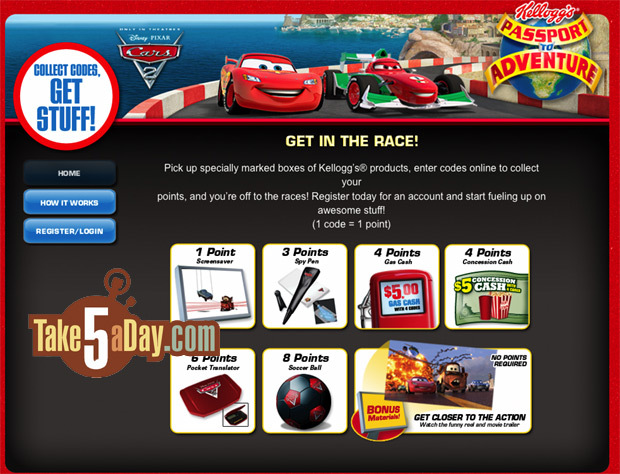 Enter your codes at the Kellogg’s CARS 2 Passport website. Not bad, $5 bucks of gas will buy you another trip to Target. But Kimberly Clark is offering way more stuff including cash, movie tickets & diecast CARS! I know the K-C promotions is also open in Canada and it sounds like in Europe and elsewhere, they are going to offer it also (but presumably on a separate website). Especially if you need diapers, load up! 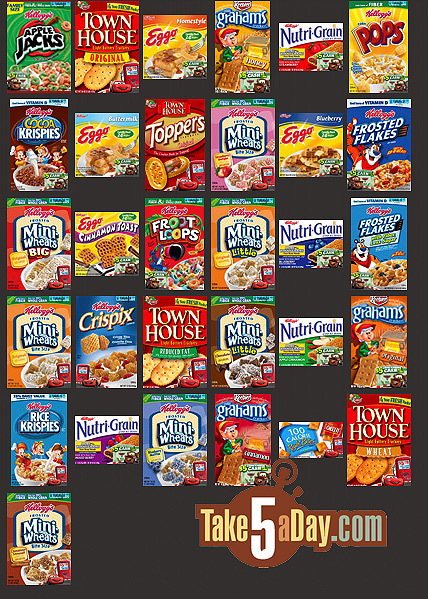 Here’s a list of the main product lines that will earn you points. 1.2 million boxes of Kleenex tissues will carry a password and 3D glasses allowing buyers to view three-dimensional Cars 2 content on a dedicated website. * Collect 20 credits from participating Kimberly-Clark product and get a Cars 2 Mattel Die-Cast Car or Crayola Giant Coloring Pages. * Collect 35 credits from participating Kimberly-Clark product and get a Cars 2 Mattel Die-Cast Car with Lights & Sounds or Crayola Color Wonder. * Collect 50 credits from participating Kimberly-Clark product and get a $10 VISA Prepaid Card or Cars 2 Movie Voucher. 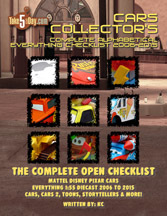 I do not know if you get to choose the diecast – when you earn enough points, let us know! 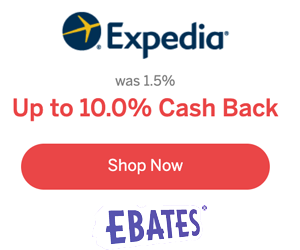 And another good deal, Rayovac Batteries will discount or buy you a movie ticket for any Disney-Touchstone movie including CARS 2. 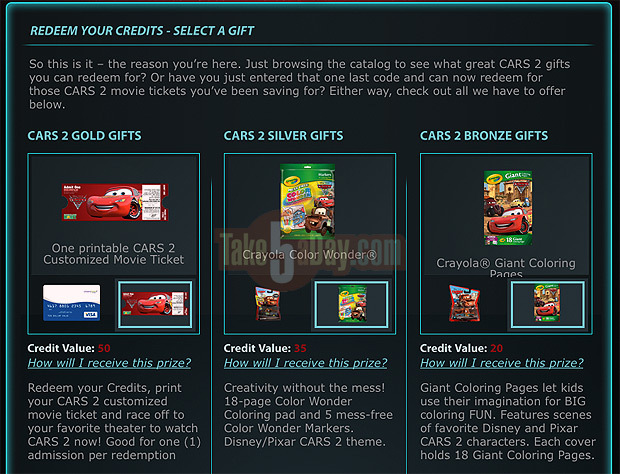 3 codes can be redeemed to receive a free print at home Hollywood Movie Money admission certificate to see Cars 2 or any Disney/Touchstone movie up to $14. 2 codes can be redeemed to receive a print at home Hollywood Movie Money discount certificate for $6 off Cars 2 or any Disney/Touchstone movie. 1 code can be redeemed to receive a print at home Hollywood Movie Money discount certificate for $3 off Cars 2 or any Disney/Touchstone movie. 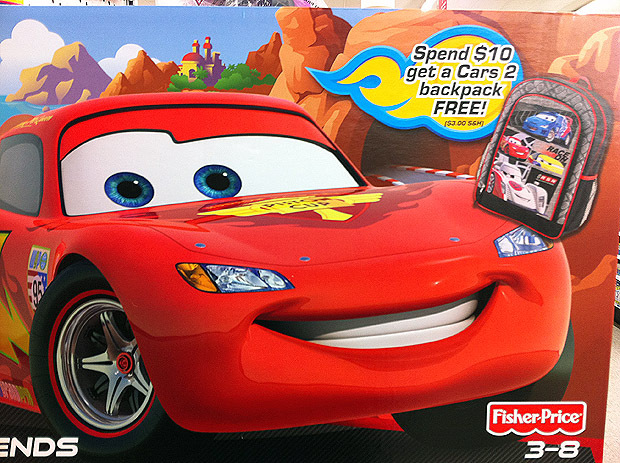 And while you might have a bunch of the CARS DVD’s – if you need a replacement or an extra, buying them at Target (ONLY) will net you a code for a free ticket to CARS 2. It’s not as good as the Rayovac deal which can net you up to $14 towards your ticket while this is capped at $8.50 back. 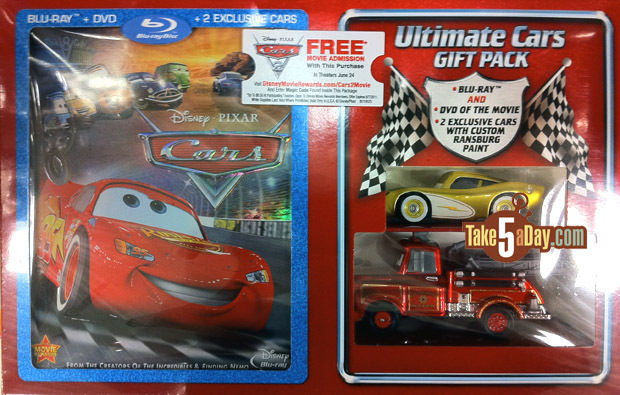 CARS Blu Ray Combo, or the CARS Ultimate (above – on sale for $29.99). Or buy Fisher Price CARS 2 stuff and get a free mini backpack. Received coupons package today promoting CARS 2 items. Here what is written on the last page about the $5.00 OFF coupon for the World Grand Prix Race Launcher?… “Fill your launcher by purchasing participating products to complete your collection with all 30 Die Cast CARS and all 15 Lights & Sounds Character CARS”. That is confusing, scary or be a good news…. Why “all 30 Die Cars” ? Is this 30 differents CARS than the regular singles? If no, why it is limited to 30??? Looks like there will be at least 15 L&S cars… MET? Can you demystify this? (MET: I think they just randomly added up all the non-exclusives out in the first wave which is about 30 – there is a L&S listing somewhere, I’ll update and do a post in the next day or so). If this is the “New Desert Art” era, maybe that’s all we’ll see before the “New Supercharged” era starts its run? My big bro has a State Farm office. Gonna have to email him! Mia and Tia’s mom is a State Farm agent. BTW…did you know Francesco’s crew chief’s name is Giuseppe Motorosi…they have a wood 2-pack with him and Francesco…so now you know his name. Also, Carla’s cc’s name is most likely Cruz Besouro. Same thing as FB…found it in a two pack o’ wood collection. Kimberly-Clark is also sending out a flyer with coupons, including one for $5.00 off the Cars 2 World Grand Prix Launcher. As a lifelong customer of State Farm, do you think they would just send me those Pittys out of the blue? Saw some kind of commercial on ESPNews this morning while getting ready to go to work. Something about Cars 2 and not driving distracted. It showed some scenes from the movie that I hadn’t seen yet. A whole bunch of the characters in different crashes. I’m guessing the Not Driving Distracted part had something to do with State Farm Insurance. It has to do with distraction.gov. Anti-texting website. I saw it online once. Now can’t find it again. Seems to be some newer cars in there too. Red/blue Ramone, etc.. There is also a Cars 2 trailer in LEGO. pretty cool. Don't drive with foam on your windshields, kids! I have to wonder how long all this will last before we once again have a hard time finding the cars we want, just like for the original movie.